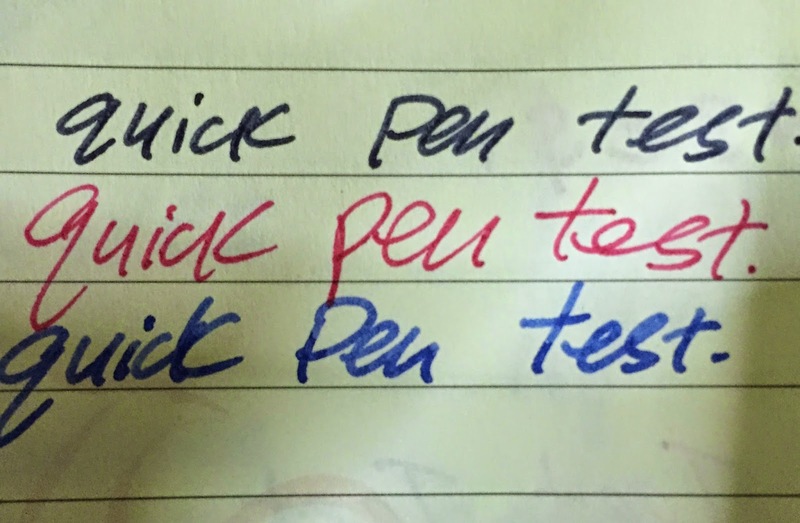 To sum up the Platinum Preppy in a few words: they are inexpensive (SGD 4.00), capable of becoming eyedroppers (2 - 2.5 ml of ink) and they write really well (smooth and without skipping!). What more could a beginner fountain pen enthusiast ask for? 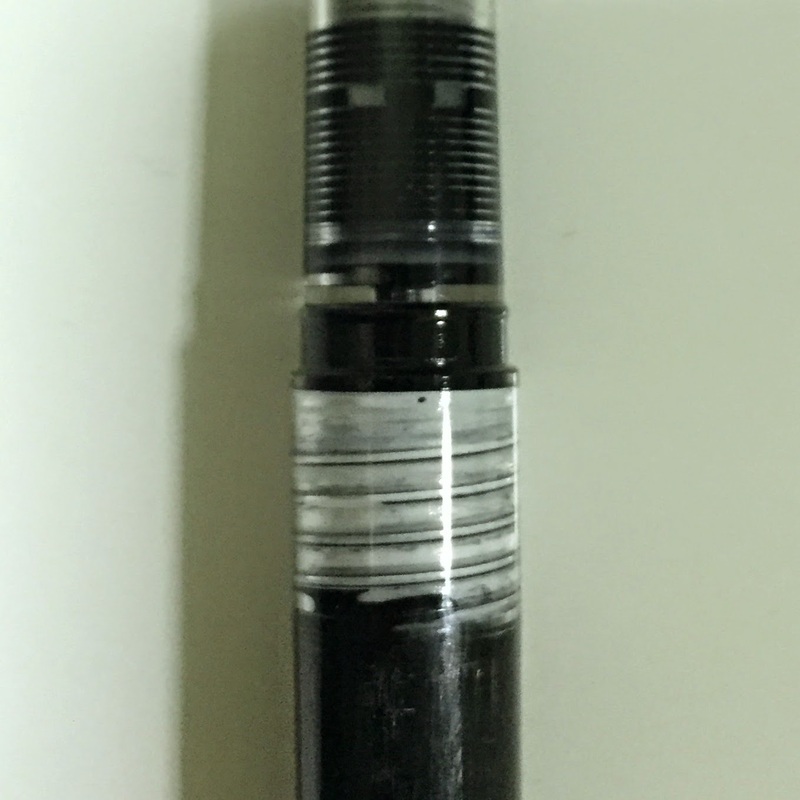 The Missive Maven's blogpost: http://www.missivemaven.com/2012/12/about-fabulous-platinum-preppy-fountain.html (also shows the Platinum Preppy with a very cool Platinum Gold Trim Converter - which makes for a very nice demonstrator pen as well). If you've seen/read the guides above, or have been googling more about the Platinum Preppy for awhile now, you'll realise that all the conversions are similar and require the same materials; O-Rings and Silicone Grease. In my own experience, those were things that a newbie fountain pen enthusiast like me (1) didn't have readily lying around the house and (2) might not know where to find straight away (unless at a specialist pen shop or purchasing them online - which takes days to come!). My guide however does not require any of those things, and I offer substitute materials that do not suffer from the 2 problems I raised earlier. For an impatient person like myself, once I bought the Platinum Preppy, I wanted to jump straight into the conversion, and my guide therefore is a result of my desperation and impatience (Though I would like to think it was as a result of my ingenuity and innovation instead!). 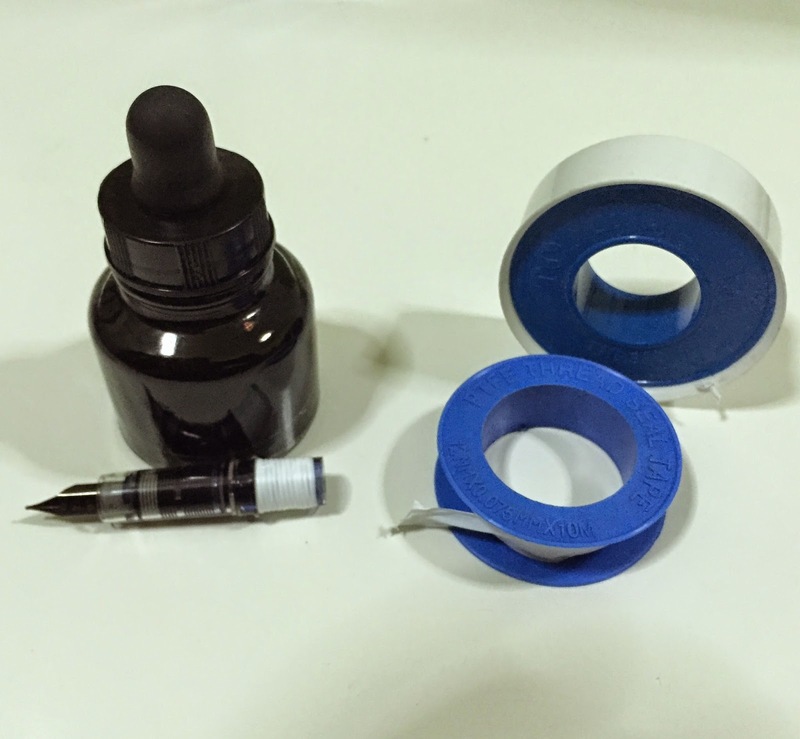 The Plumber's Tape basically replaces the need for an O-Ring as it thickens the threads on the Platinum Preppy's Nib/Feed section to create a tight and even seal (if you don't have it at home, it is commonly sold in Hardware shops and are very cheap). All you have to do is wind the Plumber's Tape around the threads (as seen in the picture above), I counted at least 10 - 12 rounds around the threads until I got a nice seal. You will know you've gotten a "nice and tight seal" once you screw on the Barrel of the pen and get a little bit of resistance while doing so. Next, you'll need to dab a little bit of Vaseline on the threads you've just fattened up with the Plumber's Tape. Then use your finger (or a cotton-bud) to gently smooth the Vaseline into the grooves of the threads. 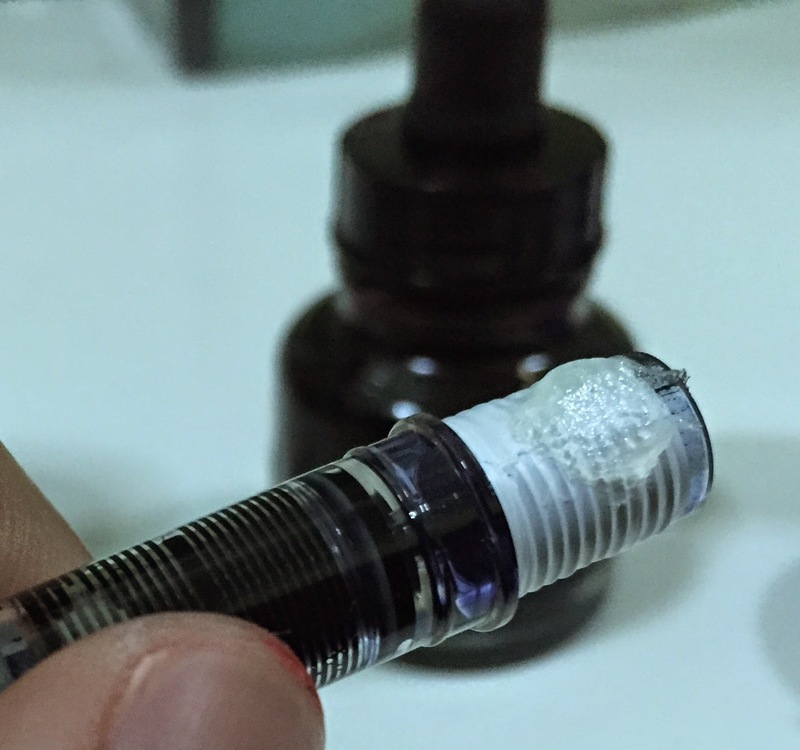 From what I learnt watching/reading the other guides, Silicone Grease is used because it is inert and does not react with the pen ink (which can be quite corrosive). Petroleum Jelly, i.e. the Vaseline, is also an inert substance and similarly won't react with the ink as well. I've used Vaseline on my Platinum Preppy for about a month prior to writing this, and to-date had not had any adverse ink-reactions and I find it works just as well as Silicone Grease. Next, grab your eyedropper/syringe and fill the barrel of the pen up with ink. 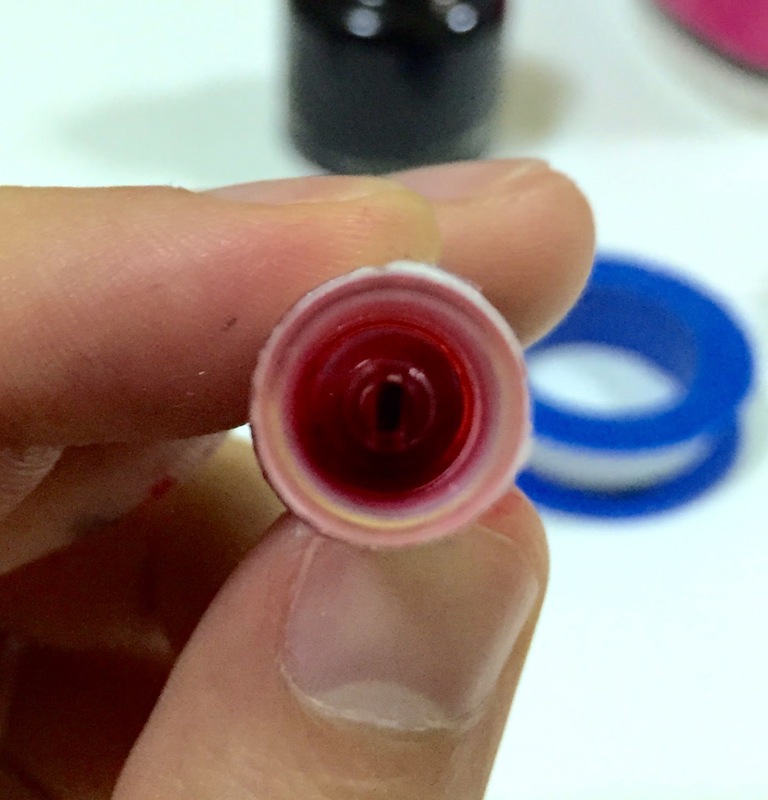 If you do not have an eyedropper/syringe handy, a trick that I used was to get a straw to draw up the ink, and thereafter (using your finger to cover the other end of the straw) transfer the ink into the barrel (by lifting your finger off the straw). 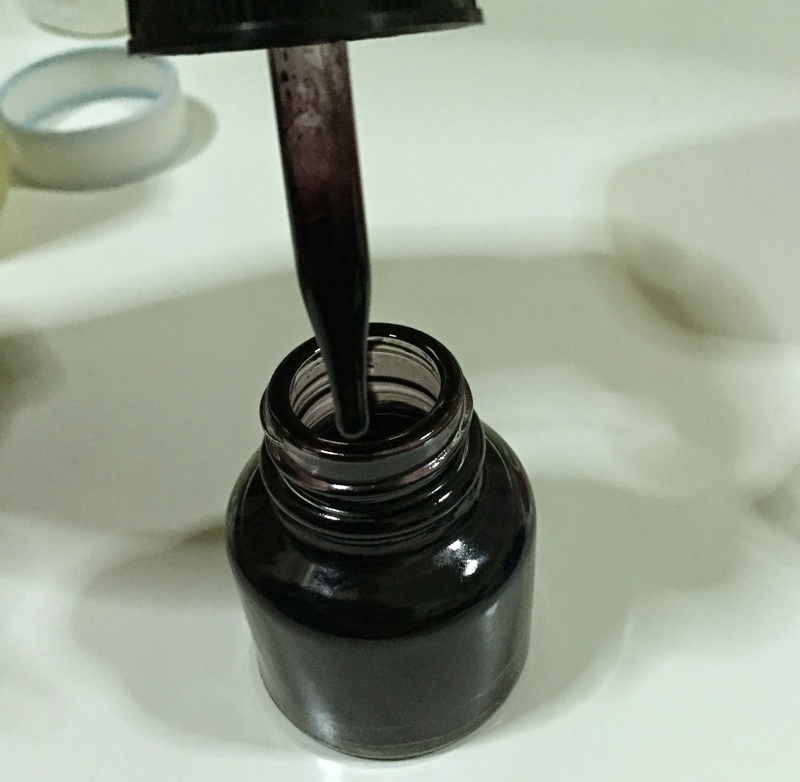 As an eyedropper the Platinum Preppy can hold about 2 - 2.5 ml of ink (from my on-and-off usage of the pens over a month, I barely even got through half the ink!). Close up your pen and there you have it, a Platinum Preppy Eyedropper Fountain Pen! 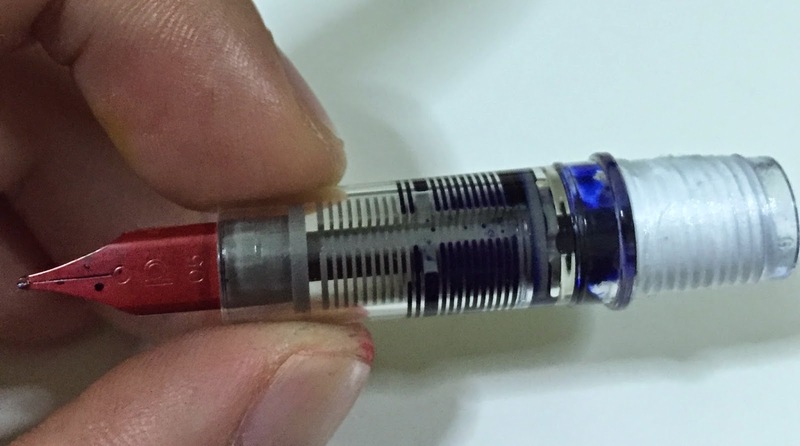 Because this is an eyedropper pen (unlike a converter or piston-filler pen, where ink is drawn up through the feed), you will need to wait for the ink to flow down into the feed and wait for the feed and the reservoir to get saturated first before you will be able to write smoothly (in the picture in the previous section above, you will see that there is black ink in-between the grey plastic - this is how you can tell if the feed/reservoir is saturated). To get the feed/reservoir saturated, just leave your pen (nib facing downwards) in a penholder for a few minutes. It could also be the case that while applying the Vaseline/Silicone Grease - you managed to get some onto the end of the feed (which has happened to me before and in my defence, applying the Vaseline can be a very messy affair! ), see above picture; this is where the Vaseline may have come into contact with the end of the feed. If so, just pull out the Nib/Feed and give the end (i.e. the end without the Nib) a wipe and then stick it back into the pen and it should write smoothly thereafter! This is where the penknife comes in useful. I used the blade and scraped along the barrel until I had got all the decals off (see picture above). I have read about people using thinner to rub the decals off too. 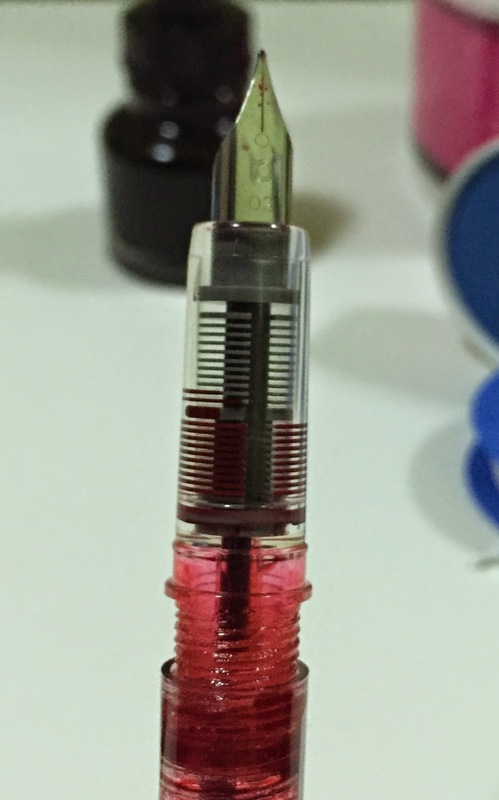 This is a picture of my Red Platinum Preppy which I had converted even without the Plumber's Tape (I used it without any incident for about 2 weeks - but it was mostly left in the penholder in my office). I just rubbed Vaseline onto the threads and screwed in the Barrel. You can do this without any risk of leakage because the threads of the Platinum Preppy are thin and tight enough to do so. But, I didn't like living so dangerously, so I applied Plumber's Tape to it as soon as I could. Note: I have read online that Plumber's Tape tends to deteriorate over time, also given the corrosiveness of the ink, I would not find that to be surprising. From my experience (of about 1 month's worth of usage), I did not find too much deterioration such as to cause the pen to leak, the tape just becomes "thinner" after awhile (also natural given the "tightness" after screwing on the Barrel). But since the Vaseline is by itself good enough, I believe the deterioration of the plumber's tape shouldn't be too much of a problem. 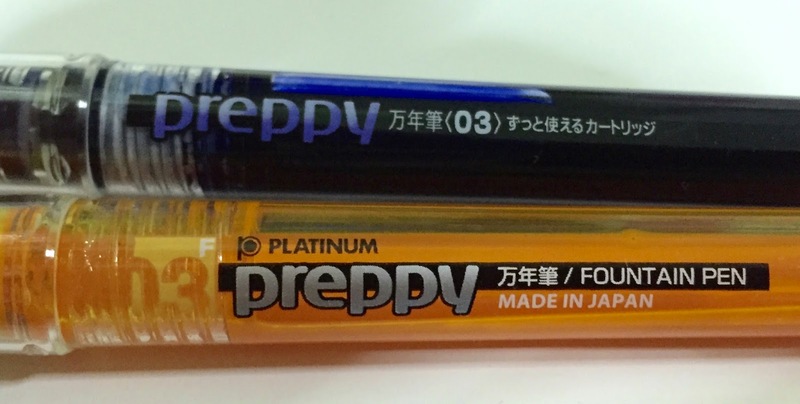 As you can see above, there are 2 different models of the Platinum Preppy - as evidenced by the different decal designs (note however that both are "fine" or with line thickness of about 0.3 mm). The top most one was bought in Popular (Thomson Plaza) and the bottom one was bought from Tokyu Hands (Orchard Central). For the avoidance of confusion and doubt - the top one has the "powder-coated" nib, and the bottom one has the "silver polished" nib. Pricing: The one from Popular was about SGD 4.50, while the one from Tokyu Hands was slightly cheaper at about SGD 3.70. The above picture shows the polished silver Nib of the Platinum Preppy I had bought from Tokyu Hands, whereas if you had noticed, the one from Popular (which I also found to be the same as the ones I got from Kinokuniya in Takashimaya subsequently) come with a powder-coated nib (in the same colour as the colour/ink of the pen). I noticed that there are slight differences in the thickness of the resultant lines produced by each though the packaging indicates the same sized line thickness. 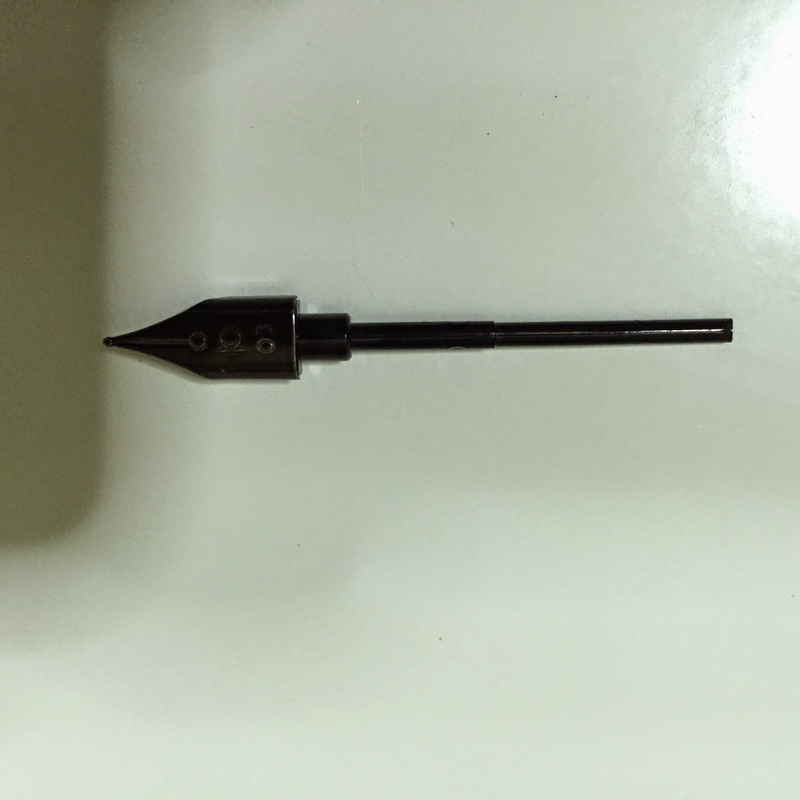 The black sample was written with the 0.3 powder-coated nib. The red sample with the 0.3 silver polished nib. And lastly, the blue sample with the 0.5 (Medium) powder-coated nib. I therefore found the silver nib to be more of an "EF" (extra fine) and the powder-coated nib to be a regular "F" (fine) nib. The End. Please let me know what you think in your comments below. Thanks for reading! Ooo very very detailed analysis, I love that! I have to admit, the plumber's tape is a rather novel approach, never thought of that. Tell me though, how does the pen behave when the ink is low? Does it spit ink? All my eyedroppers do, and it's annoying. I'm not sure how that can be avoided, it's physics. This is a great conversion technique, especially using plumber tapes & vaseline, more common house hold items. I wish I saw your site before buying silicon grease, which was not expensive. My only problem is I converted the medium size (0.5mm) pen but ink is not running as smooth as I was using a cartridge. I have to press the pen harder to get more ink sometimes. Otherwise for a lazy person like me who does not like to change a cartridge, I love this inexpensive conversion. Highly recommended! As for your Preppy, have you tried pulling out the nib and feed to wash the feed? Sometimes dirt or grease could be stuck in the feed channel and stop the ink from flowing smoothly. The video is from the Fountain Pen Revolution channel, it has some helpful information, all the best! That's a pretty creative solution, but I wouldn't recommend the use of Vaseline instead of silicon grease. 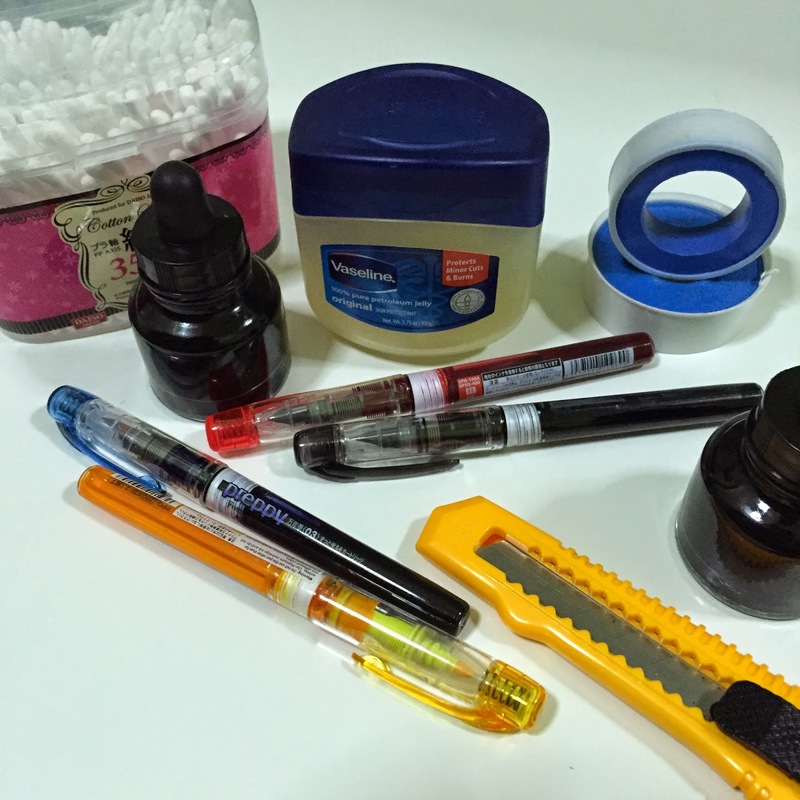 From what I understand of the chemistry, Vaseline tends to react with rubber and some plastics, so in the long run, it may cause some damage to your pens. Thanks JiggleLeaf! I did not know Vaseline was reactive with rubber and some plastics. I will bear that in mind. Guess nothing is ever absolute, and though Vaseline (i.e. petroleum jelly) is considered inert, there will always be exceptions =) thanks for letting me know! 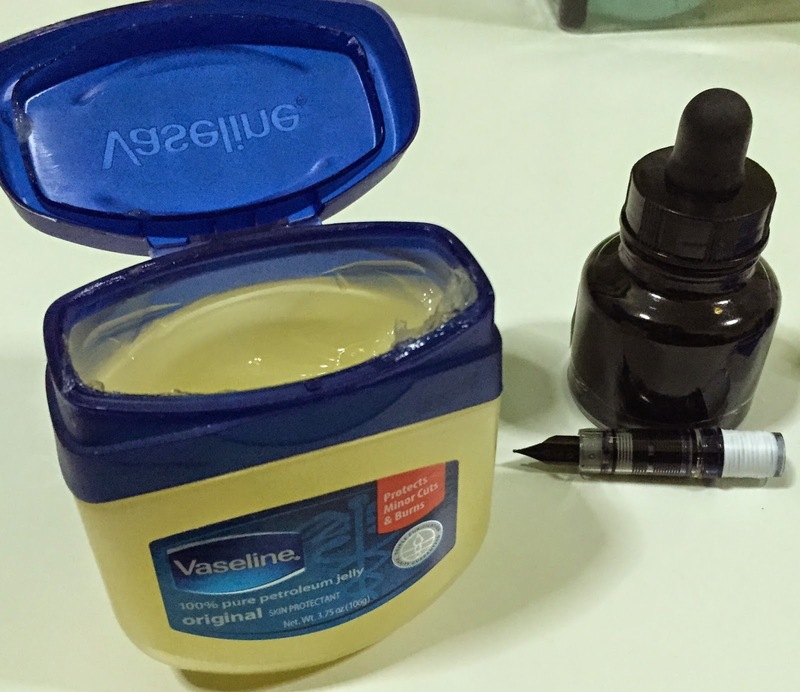 Actually, Vaseline melts latex but spares most plastics, so unless your pen is a condom, you should be fine. Thanks for sharing the details of your experiments! I was wondering about just using petroleum jelly myself. Now I feel solid about using it with my brush tip Preppy. 2) Blue-black, silver polished Medium 05 nib. Apart from the differences in physical appearances brought out in the main review, THERE IS ONE OTHER MAJOR DIFFERENCE. THE POLISHED NIB PEN HAS 'MADE IN JAPAN' PRINTED ON THE BARREL BESIDE THE NAME PREPPY WHEREAS THE PEN WITH POWDER COATED NIB HAS NO SUCH WORDS AND ON THE SECOND PRINTED PANEL ON THE BARREL IT IS WRITTEN 'IMPORTED BY PLATINUM'. Please note the word 'imported'. I CLEARLY SUSPECT THE POWDER COATED NIB VERSION OF PREPPY IS ACTUALLY MANUFACTURED IN CHINA AND IMPORTED INTO JAPAN BY PLATINUM. THAT IS WHY THEY DON'T WRITE 'MADE IN JAPAN' ON THIS VERSION. SO THIS VERSION SHOULD ACTUALLY BE STILL CHEAPER. THE SILVER POLISHED NIB VERSION IS ACTUALLY MADE IN JAPAN AS DECLARED ON THE PEN BARREL. Also, look for other small differences in the two printed pens on both pens. You will find many, clearly indicating that there are TWO manufacturing plants involved. I recommend you buy only the silver polished nib version of Preppy which is actually made in Japan. I did the same thing with a Waterman Kultur: no problems at all.